(2010/UNIVERSAL) 61 tracks (MCA) digipac. 05 Would You Like To Take A Walk? 11 Is This A Lovely Day? 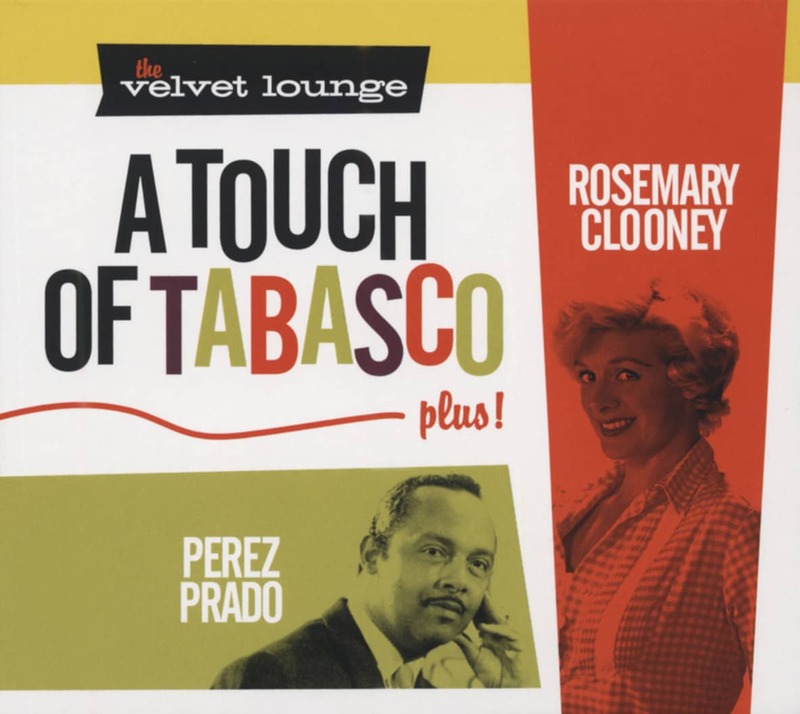 22 Medley: It's Been A Long Time/Life Is Just ..
25 Medley:September Song/As Time Goes By/Till ..
"Bing Crosby & Rosemary Clooney"
Like the steam engine or penicillin, 'A Touch Of Tabasco' is one of those inventions that simply leaves the world a better place. Two towering, diametrically opposite musical entertainers from different corners of the 1950s charts: Rosemary Clooney, the honey-voiced, Kentucky-born girl-singer-next door, whose career to that point was built on swing and pop novelties; and the Cuban bandleader and composer known as the 'King Of The Mambo.' It's an unlikely alchemy with sublime results, which we can revel in thanks to Bear Family's Christmas present of a reissue. 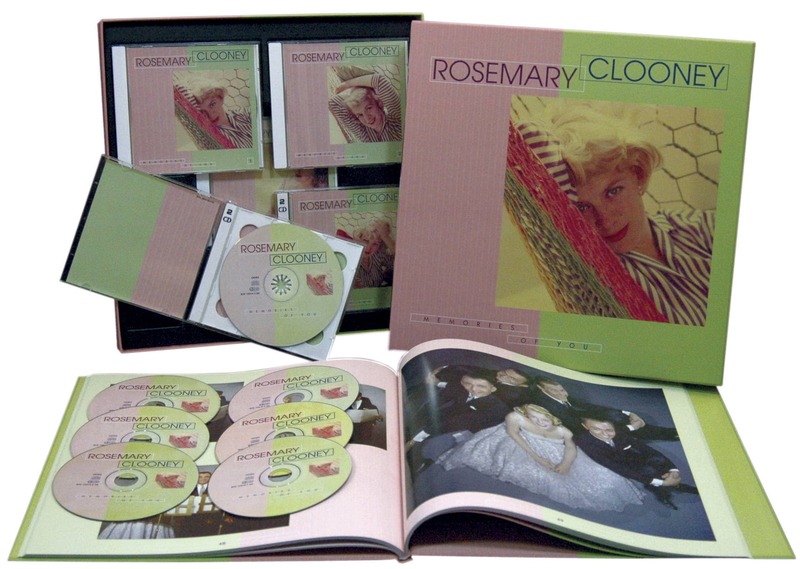 At the time this album was originally recorded in three sessions in July and August, 1959, Rosemary Clooney had spent the decade as one of the top recording artists in the world, exploding on the scene with the novelty hit, Come On-A My House, and continuing to produce a wave of hit singles for Columbia Records. Prado, as well, was at the height of his popularity, disseminating contagious Latin rhythms and loosening up the hip muscles of the American and international public. When they went into the studio for 'A Touch Of Tabasco,' Rosemary had just a few years earlier left the Columbia Records and finally come to rest at RCA, just as the trend away from hit singles and toward theme albums was taking hold. An irresistible mix of Latin standards and American songs with a Latin twist, 'A Touch Of Tabasco' features blue-chip work from both artists, neither of whom went into the collaboration with complete comfort. Most basically, there was a communication problem. Prado and his musicians spoke little English, and Rosemary's Spanish was nonexistent. Her solution was to bring in her husband, Jose (Joe) Ferrer. Ferrer, though a Princeton-educated classical actor, came from a wealthy Spanish plantation family in Puerto Rico, and throughout the sessions, served as interpreter and language coach for Rosemary, who gamely sings in Spanish on Latin stalwarts like Amor, Sway (Quien Sera), Adios, Cu-Cu-Ru-Cu-Cu Paloma, and Corazon De Melon (Watermelon Heart). "I'd ask Joe to help me with the Spanish lyrics," Rosemary remembered later. "He'd teach me how to pronounce the different Spanish words." (Notice on Corazon De Melon, her exacting pronunciation of the word 'Cora-th-on'). "Prado was wonderful," she said. "He was very shy. He talked more to Joe than he did to me. It was funny, because I really got the feeling of the band through Joe. And the guys just loved him so much, they admired him - you know, Latin men, and you get a Latin movie star…"
The son of a newspaperman and a schoolteacher, Damaso Perez Prado was born in 1916, and left Cuba for Mexico City in the 1940s, before moving to the U.S. to capitalize on his RCA success and the Latin craze of the '50s. His 1955 instrumental cha-cha of Cherry Pink And Apple Blossom White spent weeks at the top of the charts. Among his chart-topping recording successes were his compositions Mambo No. 5 (re-popularized by Lou Bega's number-one sampled cover in 1999), Mambo No. 8, and Patricia. Rosemary was born in 1928, in Maysville, Kentucky, the daughter of a house painter (and granddaughter of the mayor of Maysville). After starting her career teamed with her sister, Betty, as a teenage radio act on the Cincinnati mega-station WLW, she and Betty were hired as girl singers by the Tony Pastor band, they toured the country. 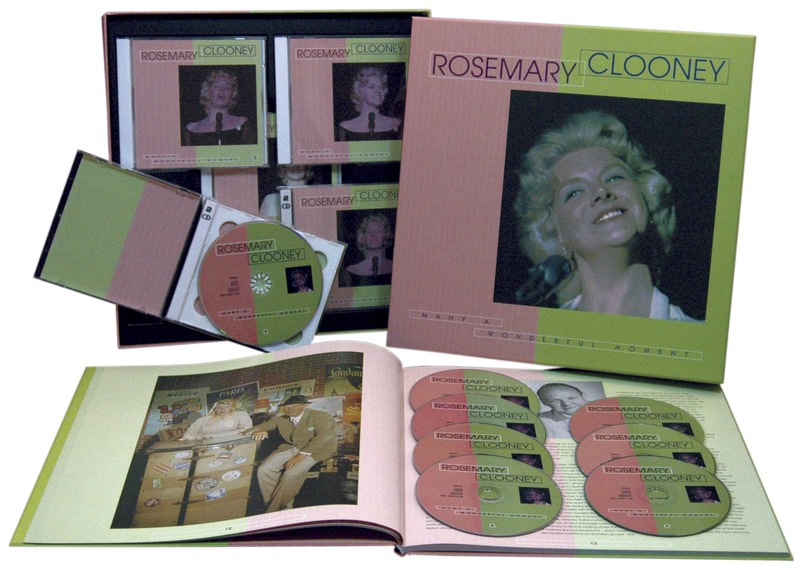 Rosemary made her first solo recordings with Pastor, gaining attention in the industry and shortly after she left the band to go it on her own, a contract with Columbia Records, under the tutelage of Columbia's A&R Svengali, Mitch Miller. Following her breakout recording of Come On-A My House, she produced a string of hit singles for Columbia that included Hey There and Tenderly, which is still ranked as one of the most beloved recordings of all time. Her first hit records were followed by a movie career under contract to Paramount Pictures (her most famous film role, opposite Bing Crosby in 'White Christmas,' which spawned a lifelong musical relationship with Crosby, her idol. For Rosemary, 'A Touch Of Tabasco' was the opposite side of the artistic coin. Here, to Prado's brass-and-percussion-marinated dynamic rhythms, with his between-the-beat mambo grunts, Rosemary brings her own dead-on rhythmic sureness and impeccable phrasing and diction that is at once right for this material and also distinctly Clooney. "The rhythmic thing was certainly different from the usual thing I did," Rosemary said. Normally intensely sure of herself musically, she felt intimidated enough by the genuinely Latin experience (as opposed to her Latin-esque novelty hits like Mambo Italiano), to be a little conservative going into it. "It was just different," she recalled. "My rhythmic sense is there. But number one - I usually will change the measure of a note - the beat of how long to hold it - to get across a lyric in a different way, if I feel like it. But with this I was more cautious because the band was so strict with the kind of thing they were doing. That was their forte." The science may be inconclusive, but Stafford had a point. Clooney’s phenomenal wave of success had begun just a few years earlier with Come On-A My House. But the middle and late 1950s—the years covered by this second volume of Bear Family’s anthology of Clooney’s complete recordings—finds the singer not only at the height of her powers, but with a blossoming domestic life centered on her new husband, Jose Ferrer, and the arrival of their five children. This set begins appropriately with the Al Hoffman-Bob Merrill song, Where Will The Dimple Be, from a January, 1955 session. Less than a month later, Miguel Jose Ferrer was born, and Rosemary’s children would then come about a year apart through the end of the decade. The Ferrers had settled into their Roxbury Drive home in Beverly Hills, a house inhabited by the Gershwin brothers at the end of George’s life, where they’d written Love Is Here To Stay. Ira now lived next door with his wife Leonore. For Rosemary, it was a time when everything in her life seemed to come together. The uncertainties of her own childhood in Maysville, Kentucky, when she and her sister Betty were shuttled between relatives for their care, now gave way to the security and joy of having her own family around her. Joe Ferrer divided his energies between motion pictures and maintaining his prolific acting and directing schedule on Broadway. The house was endlessly filled with the couple’s friends from the musical, theatrical and literary establishments, who spent long California days swimming in the pool, playing tennis and debating the affairs of the world over drinks and dinner. At the same time, Rosemary’s career remained in high gear. Mitch Miller’s tutelage at Columbia had transformed her from Tony Pastor’s ex-girl singer into an international star with number-one chart records one after the other over the last four years. ‘White Christmas’, the hallmark of her film career at Paramount, had just been released in 1954, cementing her identification in the public mind with her co-star and mentor, Bing Crosby. As a new mother, she maintained a hectic agenda of radio, television and personal appearances, along with continuing her prodigious recording schedule for Columbia. Rarely, now, were the sessions conducted in New York, as they had often been in the early days under Miller’s eye. With Rosemary ever-more ensconced in California, distance was added to the already existing tensions between the singer and Columbia’s A&R wizard, and as the ‘50s wore on, Miller’s influence over Clooney’s recording career--from style to choice of material--lessened drastically. In the summer of 1955, with baby and nanny in tow, Mr. and Mrs. Ferrer left for an extended stay in England. While Ferrer was there to finish filming ‘Cockleshell Heroes’ with Trevor Howard, Rosemary would make her debut at the London Palladium for a two week engagement. They took an old mill house in the country on the Cone River, up against one of England’s interior canals, and with a lake on the property. They had an Italian couple cooking for them, and picked up a basset hound named George (it was Rosemary and Betty’s Uncle George Guilfoyle, recently home from the war, who’d been the teenagers’ chaperone when they went on the road with the Pastor band). Although Clooney was accustomed to making personal appearances (it actually hadn’t been all that long since her bandsinger days), the back-and-forth with an audience was still not that comfortable for her, and it would be years before touring with Crosby taught her to feel significant ease before a crowd. Even so, the live record of her unscripted Palladium patter gives us an early glimpse of the easy, ad-libbing humor and straight-ahead personality for which she would eventually become legendary. With Cole at the piano before the Skyrockets Orchestra, the show largely featured a sampling of Clooney’s signature hits to date, including Tenderly, This Ole House, Mambo Italiano, Botch-A-Me and of course, Come On-A My House. To the mix, she added Cole Porter’s From This Moment On and It’s Delovely, Irving Berlin’s tailor-made Love, You Didn’t Do Right By Me from ‘White Christmas’, You Make Me Feel So Young, Where Will The Dimple Be, The Brahms Lullaby, and always proud of her Irish heritage, Danny Boy—all of which created a sensation with a hysterically enthusiastic British audience. Both the man on the street and area luminaries (including Dietrich, Noel Coward, Laurence Olivier and Vivien Leigh) arrived nightly in droves, and their cheers produced a wall of sound that caused her to involuntarily flinch the first time it hit her. The program, with its accumulated chart-topping songs of the past few years, affirmed the solidity of Clooney’s international stardom. At the same time, there is something retrospective about it, in that musically she was about to embark on a new chapter in her development as an artist. From that time forward, the nature of Clooney’s recorded work started to change. The rest of the ‘50s saw not only the singer in blissful vocal shape, but reaching beyond the novelty songs imposed on her by Miller and Columbia in the early years to deepen her range of material. Her growing maturity as a woman and a singer exerted itself not only in her more confident pursuit of what she felt was right for her, but carried over to a more consistent sophistication of arrangements and overall sound. Columbia’s commercial priorities, which (apart from Tenderlys) had planted Clooney firmly in the path of the kitschy and the kooky, now afforded her room for some significant explorations. Benny Goodman and Rosemary were strangers when they were teamed to cut three records in November of 1955. A fan, she was well acquainted with his reputation as a musical perfectionist often difficult to work with. She also knew about The Ray – the legendary withering glare he would fix on any musician to have incurred his displeasure.“I liked him fine,” she says. “He was weird, but I liked him.” They were to record three of his signature tunes: Cole Porter’s It’s Bad For Me and Gordon Jenkins’ Goodbye with the sextet, and the Andy Razaf-Eubie Blake Memories Of You with the trio, the record would reach number 20 on the charts. 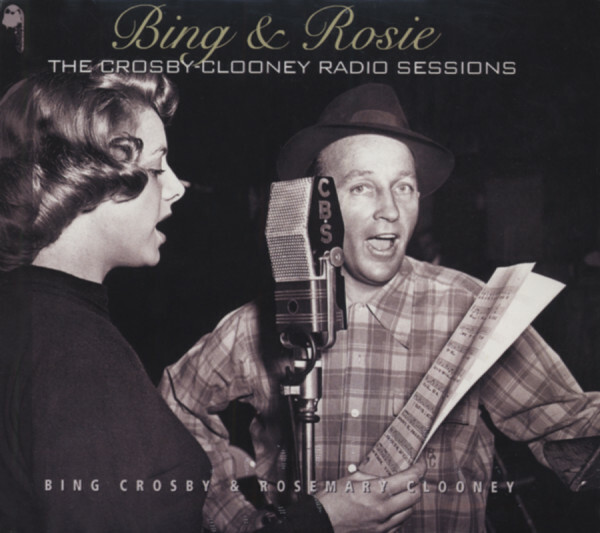 Customer evaluation for "Bing & Rosie - Radio Sessions...plus (2-CD)"